VATICAN CITY (CNS) — Always, but especially during a Holy Year, the Catholic Church does everything possible to help Catholics repent of their sins, receive forgiveness and draw closer to God. 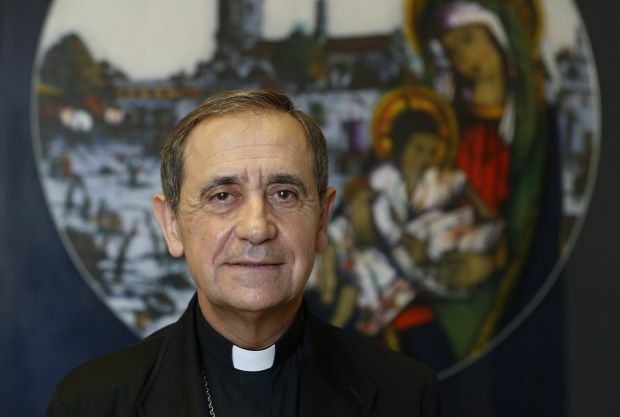 The church’s law and its canon lawyers are part of that effort, said Bishop Juan Ignacio Arrieta, secretary of the Pontifical Council for Legislative Texts and a prelate of the Apostolic Penitentiary, a Vatican court handling matters of conscience. The first step, of course, is to recognize an action is a sin and confess it, expressing contrition and a willingness to do penance. Bishop Arrieta said the pope’s action is designed to ensure that the path to penance and reconciliation is not blocked by a priest not having the full authority to offer absolution in the name of God and the church. In an interview with Catholic News Service June 2, Bishop Arrieta said the pope’s mention of “reserved” sins refers to actions that can bring with them automatic excommunication, for example, abortion when the person is aware of the penalty and commits the sin anyway. The missionaries of mercy will have the “faculties” or authority to remove the excommunication and grant absolution in those cases, which normally require the intervention or permission of the local bishop or the Apostolic Penitentiary, he said. Some commentators have questioned whether the pope’s plan for mercy will send the message that abortion isn’t a serious sin. But for Vicki Thorn, founder of Project Rachel, a ministry promoting healing and forgiveness for those who regret an abortion, it is a crucial part of the Year of Mercy. “For millions of women, in their hearts abortion is the unforgiveable sin,” Thorn said during a telephone interview from her home in Milwaukee. “This sin holds people hostage,” she said. In the Latin church’s Code of Canon Law, Bishop Arrieta said, the offenses that carry automatic excommunication are: apostasy, heresy and schism; profanation of the Eucharist; physical violence against the pope; attempted absolution of an accomplice in sexual sin; attempted ordination of women; consecration of a bishop without papal approval; violating the secrecy of the sacrament of confession; recording the words of a confessor or penitent during confession; procuring, performing or actively assisting or pressuring a woman into having an abortion. “All sins can be forgiven,” Bishop Arrieta said, but more serious sins are also considered crimes under canon law and carry penalties. In order to receive absolution, a person must be allowed to receive the sacraments, which he or she cannot do while under the penalty of excommunication. However, when an excommunicated person is in danger of death, any priest can hear his or her confession and grant absolution, the bishop said. That is because the priority in the church’s law is the salvation of souls. “All the barriers of canonical penalties fall when faced with the need to save souls and the danger of death,” he said. When a woman goes to confession seeking absolution for abortion, “the problem is not the sin, but the penalty, which prevents the reception of any sacrament,” Bishop Arrieta said, which is why Pope Francis is making special global provisions. In most dioceses of the United States, England and several other countries, the bishops regularly give all their priests the faculties to grant absolution for abortion. But in other places, like Italy, such permission is given only on special occasions. He said, however, the permission would be valid only during the shroud’s public display so as not to “diminish the rigor of the law,” which is designed to teach people how seriously wrong it is to kill an innocent life. Bishop Arrieta said that when the Code of Canon Law was being revised in the 1970s and ’80s, church officials had long, passionate discussions about removing the penalty of automatic excommunication for an abortion. After all, the serious sin of murder does not carry the penalty of automatic excommunication. The penalty was maintained, however, because officials believed it could “give a distorted impression that the church no longer sees abortion as so grave,” he said. “Sin is sin,” Bishop Arrieta said, and the offenses that can carry automatic excommunication are especially serious, but a Holy Year is an especially serious time of grace. By granting a special faculty to certain priests during the Year of Mercy, he said, Pope Francis is trying to balance a desire “to facilitate reconciliation as much as possible” while also “trying to form consciences” about the seriousness of abortion. “The church has a spiritual patrimony and during a Holy Year, it encourages the faithful to draw on this patrimony” for the grace and strength to reconcile with God and begin a new life, he said. The pope is not saying that any sin is unimportant, the bishop said. “No, not at all. The pope is saying the church is like a field hospital in the middle of battle and the treasure of the merits of Christ and of the saints must be distributed broadly” to heal the wounded.